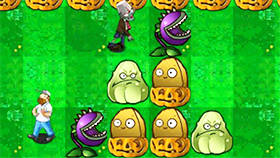 Zombie Crisis is an interesting arcade game. This game has unique graphics, suitable for all ages, especially children and families. You can experience this game on your browser because it is a flash game. This game has 3 modes for you: Story - Survival - Time Mode. However, you need to complete the Story Mode to unlock the remaining modes. Story Mode has 40 levels, each level is a challenge for you. You will play in a vertical screen. Your enemies in this game are zombies. Zombies will appear in waves and they will go to the bottom of the game screen. If you let a zombie survive, you will lose 1 HP. If you lose all HP, the game will end (you have 3 HP). You can also use Eyeballs to buy items in the Shop, such as 2x Lives, 3x Electric Shock, 3x Giant Brain ... You can get eyeballs by playing survival and time mode. This game has 18 achievements waiting for you to conquer. This game has mobile version for Android. You can download it on Google Play.